CIM is a point to point course, from the Folsom dam to the state capital in Sacramento, along rolling terrain. It is considered to be a “fast course” but that is partly due to the fast field it attracts... It draws many elite marathoners who this year were looking for their last shot at an Olympic trials qualifying time. The race also has a high percentage of runners who end up BQ-ing (last year the percentage was around 22). They even have a BQ bell at the finish for folks to ring if they hit their BQ. There tends to be a longish line in the first hour or so to get to the bell. Now this is not exactly a "Mickey Mouse" course. The first 17 miles have constant climbs and descents. There's about 300ft of inclines in the course but there also ends up being an overall net decline in the course of 300ft. That can give an advantage. Also, aiding a fast time is that there are very few turns on the course, the mile markers coincide with highway markers, there isn't a course correction factor (added for some of the larger races), a smooth pavement and it is very well organized (for instance there are 17 water/aid stations). There is also a relay component where teams of four split up the marathon. The race course has a lot of similarity to Boston. An experienced CIM and Boston marathoner remarked that if you could organize the hills in Boston to your advantage you would end with with a course similar to CIM. 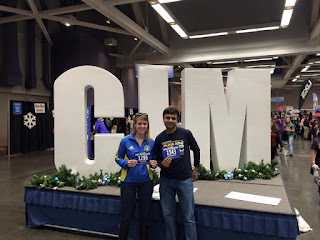 Last year, I had an almost perfect race at CIM, so when I saw an opportunity to signup for next year at a "re-run" price of $89, I jumped on it. In some respects running the course again would be a good apples-apples comparison of how my fitness had progressed or retrogressed in the last year. I intended to run Chicago as my Fall race. Given that Chicago has had some bad weather days in the recent past I needed a back-up. This ended up being prophetic since Chicago did have sub-optimal conditions and I didn't run the race I wanted to. Change my approach for tapering with less miles and more intensity. I was thinking back to advice from Jonathan. Given how crappy I felt in the taper for Chicago this made sense. I would be going for broke. I knew there would be a chance that this would result in the wheels coming off and an ugly finish. The aggressive goals I had for myself were: 3:07, 3:03 and 2:59:59. On race weekend Saturday, I retraced my steps from last year. I took the same flight and stayed at the same hotel. I lucked out with a window exit seat on my southwest flight. I could not believe it was not taken. My legs definitely appreciated the extra leg space! I met up with Allison for a "group" picture at the expo. Interestingly, the bibs numbers were assigned by last name. I had 1543 which did make the numerologist in me happy. The only difference from last year was that I decided to stay off my legs longer and cooked my own food. My optimal source of carbs is rice. That always seems to be a challenge to find in restaurants! I had two full plates of rice at 4pm and 8:30pm. My obsession with the weather forecast continued... I wanted it to be in the 40Fs so that I could be certain about wearing just shorts and Ts. There was rain in the forecast but hey I'm from Seattle :p It's ironic though that there was rain for five hours during the weekend - the time we'd be waiting for the shuttle and running! I came across "rain racing" guidelines about minimizing the amount of "seeping" clothing - bear skin was to be preferred to longs. I had some fun conversations with a couple of other runners at the hotel - with the race director for the Wishbone race and organizer for TunnelLite and a guy from Switzerland. I woke up to see the forecast of guaranteed rain transformed to a chance of showers. I remarked to myself - "This my friends is what we call a miracle of festivus!!" Unlike last year I was not unduly perturbed about getting to the shuttle pickup point exactly at 5 am. Once I got there I sat in the host hotel instead of standing in the long lines. Soon there were multiple parallel lines for the shuttles. I got up joined one of them and was soon on my way. I had an interesting conversation in the bus with someone who had run CIM multiple times but had not run it recently. I felt much better in the bus than I did last year. Perhaps that was to be taken as a warning sign. Once I reached that start I hit the porta-potty lines. There were several porta-potties and I did not have to wait for long. You've got to love how things that matter are so well taken care of at CIM. It had started raining/drizzling so I joined several runners who took shelter by the shops near the start. After a bit I moved to a gas station to take shelter... Twenty minutes before the start, I shed my hoodie, dropped off my drop bag and made my way to the start. Then, it really started pouring! I found a tent near the start to hang out. Soon a bunch or runners joined me. I was so close to the start that I could see the lady who sang the national anthem. The start lineup is informal (without corrals) but organized. It was a luxury to be able to leave the dry tent only five minutes before the race started. I had in my pocket Taz splits for a sub-3, which indicated that the first mile was to be the fastest mile in the race. I attempted to hit the split for the first mile. In hindsight this was wrong at many levels and unlike the way I run marathons. It would be the only Taz split I hit and the only time I looked at the Taz band. I had begun to feel quite thirsty and the first water stop could not come soon enough! It started raining/pouring and would continue doing so till mile 8. It did not impact me while running but I would feel the blisters later in the race. My legs felt tired while going up the inclines. I was not feeling as strong as I did last year and I began to notice my splits lagging last year's splits. The first relay point which in some ways resembled a major exchange at Ragnar. It was awesome to see folks cheering as they waited for their teams. Jonathan called out my name... I would see him two more times on the course. The 3:05 group had caught up with me. That was disappointing and demotivating. This was a repeat of Chicago but at least that did not happen till the half way point. I heard the 3:05 pace leaders promise their followers that they were right on pace. I tried to keep the pace group in my sights but they were pulling away. I was a couple of minutes behind my pace from last year and I was fading fast. There was quite a bit of support at the half way point. There would be a sign indicating that we had hit the "middle miles". I had began to feel things falling apart physically - right calf and quad, left hamstring and blisters on my lower feet. It was perhaps due to a medley of things - not having recovered from last week's Seattle pacing effort, starting out too fast and deciding to run in "test" shoes. They had an actual brick wall to run through just after mile 20. This was quite neat. Additionally amazing was a full marching band and lots of other people playing music, dancing, etc. It was the turn of the 3:10 group to now pass me :( I had no chance of keeping up with them. I would also start to walk for the first time - I surrendered. The signs indicated that we had hit the "final miles". I had a lot of time to examine the overpass this year. I walked some and ran some... I was walking when I saw Jonathan. Embarrassed I smiled and jogged for a bit. We began to see race photographers taking pictures. I tried to appear strong as I passed them but I was absolutely certain I wouldn't be ordering those this year. I spent a lot of time running around a girl from Brooklyn. She was running at a slower pace but not stopping as much as I was. I was running faster than her when I was running. She offered words of encouragement to me. That seemed to propel me to get ahead of her. The 3:15 pacer and a couple of runners with them had caught-up with me. I ran with them for about half mile and that helped me stop walking for a bit. It would have been nice to be able to have kept up with them to the finish but I could not do so mentally. On the positive side I registered and had the time to see a lot more of the course this year. I admired the beautiful neighborhoods and mansions lining the streets. My left hamstring was starting to lock. If we had to go another mile I probably would not have had the ability to run anymore (kind of like St George 2007). The last turn for the different men's and women's finish... I was careful to avoid anyone in my finish line pics this year. I think the contrast between the finish this year and last year could not have been more stark. I was on top of the world last year. This year I was feeling pretty low. I saw excited folks lining up to ring the BQ bell. This marathon and perhaps this entire year was overshadowed by my race here last year. That was such a perfect race! I attempted to beat or match it all year. I did realize at times that my fitness was not at the same level yet I ran to beat last year's time. As a result I had a fade in Chicago and a more painful finish here. I used to be good at running marathons based on effort. That's what I need to get back to. A major factor was that I was about 10 pounds heavier than last year - a realization that running a lot is not a substitute for eating right. Scanning through all my race results I noticed that this was my 7th fastest marathon in all. It was also my 40th marathon. At the end of the day, I am always thankful for the ability to finish a marathon - whatever the finish time. I know that this, running a marathon, is something I won't have the ability to do someday. That gratitude is magnified on reaching a milestone such as this - completing 40 marathons. 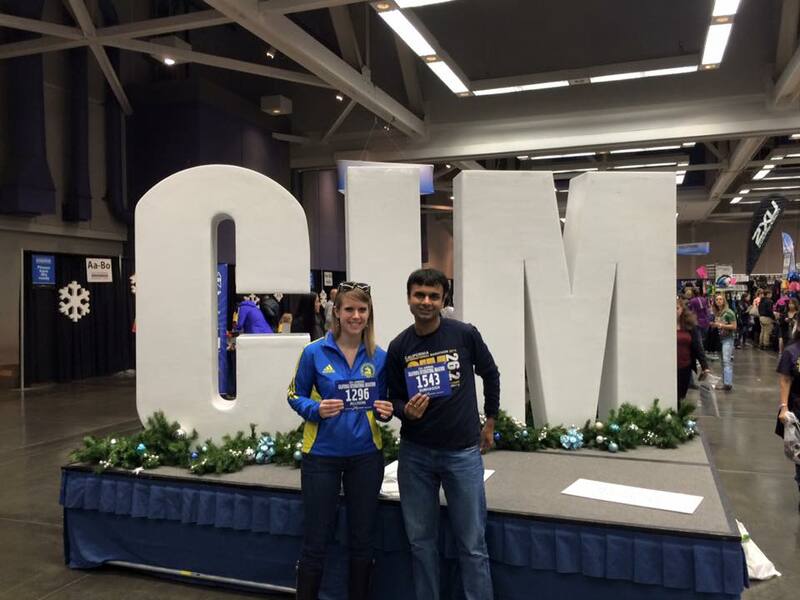 I won't be running CIM next year but I do expect to run it again at some point. I've got sometime to reflect and come up with a game plan for Boston. I am sure I'll be motivated for redemption come Patriots day!